For us, 2010 was a year of learning for both the parents and the children in our household about what allowance means, how it works, and what kinds of money lessons our children are learning. 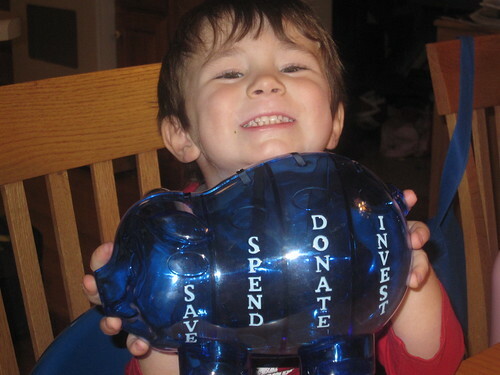 Our son received a Money Savvy Pig for his birthday, which has four slots to designate savings of various kinds. The bank featured a “spend” slot (you can spend that on whatever you want), a “save” slot (you’re saving up for a larger item), a “donate” slote (you’re donating that money to a charity), and an “invest” slot (you’re going to invest that in the future). 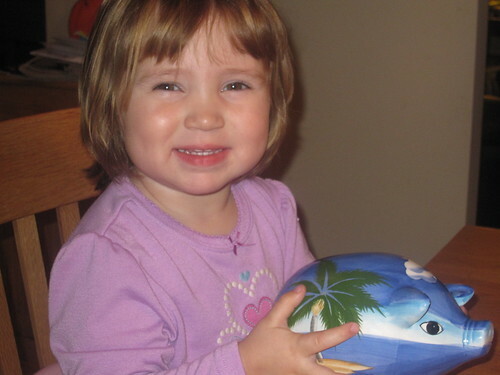 In order to minimize sibling rivalry, we gave his younger sister a single-slot piggy bank. We decided to try a weekly allowance for each child, giving them each two quarters for each year of age they were. For the older son, we made a requirement that at least one quarter of his allowance had to go into each slot. The allowance was not tied directly to chores, but we occasionally gave them both opportunities to earn a few extra quarters through helping with chores that were above and beyond the usual household expectations for them. The younger one is a saver! Each week, our daughter would put her quarters into her bank and then put it back in the cabinet. We allowed her to decide when and how to spend the money inside, but almost without fail, she never wanted to spend it on anything. She likes that her bank is getting heavy. She has only used her allowance twice, both times on individual large toys, and neither time did it empty her bank. She doesn’t have any specific savings goals for the future at this point and seems to mostly enjoy having lots of quarters in her heavy bank, even though she understands she can use them for things that she wants. Our son has no problem with the actual saving process. His problem is that he gets heavily into saving for specific goals, but by the time his savings starts to approach a goal, his interests have changed and he ends up having a new target for his savings. Thus, when he actually reaches a goal, it’s usually for an item that he’s just recently decided on. He typically does not use his “spend” slot for small things, as he prefers to be patient and use it as part of his “savings” slot. He has expressed a desire to give the money in his “donate” slot to Jump for Joel, but that hasn’t occurred yet. The “invest” slot is going to eventually turn into a savings account at our local bank, perhaps around his sixth birthday. We want to establish that the basic things we expect from them around the house, like clearing the table after meals, basic politeness, and so on, are not tied to any form of compensation. Such basic behavior is expected. Their allowance is merely a tool to teach simple money management. Our children seem to respond better when there are not bribes involved – bribery works well the first time, but after that, would you really expect them to do that thing you want them to do without compensation? Typically, allowances are doled out on a Sunday, and both of our children anticipate it and request it. They’ll often ask on Saturday if that day is “allowance day” and an allowance request is usually out there by noon on Sunday. It doesn’t seem to be a money-grabbing thing; I think they just have fun putting the coins in their bank and then lifting them up to feel how heavy they are. This not only builds on his allowance, but upon many of our discussions when shopping. He now understands that things have different prices and different costs. You have to spend more of yourself in order to acquire a more expensive item. Spend more of yourself? When you spend money, you’re really spending time and energy. In my son’s case, it’s time. He doesn’t always ask how much it will cost; he often asks how many weeks he will have to save to pay for the item. He already has a basic understanding that money represents your invested time and effort. Money is simply a piece of paper that says I’ve invested a certain amount of time and energy in this. Deeply understanding that changes your relationship with money. It makes the money less abstract than before and much more real. It makes debt more frightening and good choices more appealing. Invested money, which earns interest, seems almost miraculous. These are exactly the lessons we want them to learn from this allowance experiment. These are small, early steps, but they’re all signs that they’re heading down the right road, one that will put them in a place where they won’t repeat the money mistakes of their father.